Scientists have been looking for ways of modifying the Earth's environment to control global warming - it's known as geo- engineering. One way to do this is simply to reflect more of the sun's light, changing the Earth's reflectivity, or albedo. This could be attempted using vast, flexible space reflectors placed in orbit around the Earth. Alternatively, various types of "stratospheric aerosols" could be released in the upper atmosphere to scatter some light back out into space. Earth-bound reflectors could do the same. Another approach is to directly reduce the atmospheric carbon that, among other things, leads to temperature rises. This could be done by "fertilising" the ocean , stimulating the uptake of carbon by surface algae that would eventually sink to the ocean floor. Exposing the surfaces of carbonate and silicate rocks in "enhanced weathering" could provide a place for carbon to be absorbed. 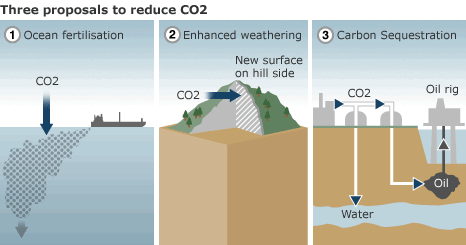 Another frequently mentioned proposal is the capture of carbon dioxide from the air using "artificial trees", followed by liquefaction and storage, probably in underground reservoirs. 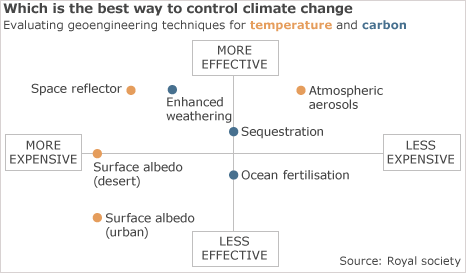 geo engineer image There is no single geo-engineering "silver bullet" that should be pursued as an all- encompassing solution to climate change, says the UK's Royal Society in its analysis of the cost of a range of proposals compared with their efficacy. Stratospheric aerosols seem to offer the most effect for the least investment, and could be deployed soon, but present an unknown risk to the environment. 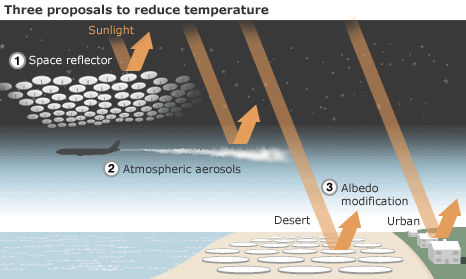 Changes to desert surface albedo are projected to be more effective than ocean fertilisation, but both could change delicate ecosystems in unexpected ways.